In our previous articles, we talked about how to have beautiful skin and the preparation of makeup and complexion, so we can spend quietly on eye makeup! If we had to make a list for eye makeup we would not get away! Whether in specialized beauty shops like SEPHORA, NYX, KIKO, on the internet and even in a corner in clothing stores or supermarkets, you are more than surrounded by possibilities. For all tastes and budgets make your choice! The desire to make up the eyes is to want to intensify your eyes daily or for a special occasion, to succeed you will need some tools and products. Eyebrow brush: A double-ended brush: one beveled side and one side with bottle brush. The bevel serves to fill and define the line of the eyebrows and the brush headdress. Shadow brush: This is often a brush with short hairs, dense and tapered. It is used for precision work such as putting blush homogeneously on the eyelid. Brush for the hollow of the eyelid: it is a long, tapered and very flexible brush which is used to apply the makeup in the fold of the eyelid to give depth to the eye. Stumping brush: This is a round and flexible brush that serves to fade, it will be very useful for smocky. Eyeliner brush: This is a straight brush or beveled more or less fine used to apply a line flush eyelashes. You will find it most often integrated into your eyeliner product (same for the mascara brush!). Depending on whether you want a simple or extravagant makeup, you can choose strong pigments or more melted, in any case brands like MAC or GEMEY MAYBELINE or TOM FORD are really quality. For eye makeup, there are, of course, eyeshadow of various textures, pencils also with variable textures, kohls, mascara, eyeliner and even false eyelashes! Let’s not forget the basic premise above all else and why not the fixer in the end so your makeup will hold up well. Makeup for the eyes: Which colors? Let’s start with the beginning ! 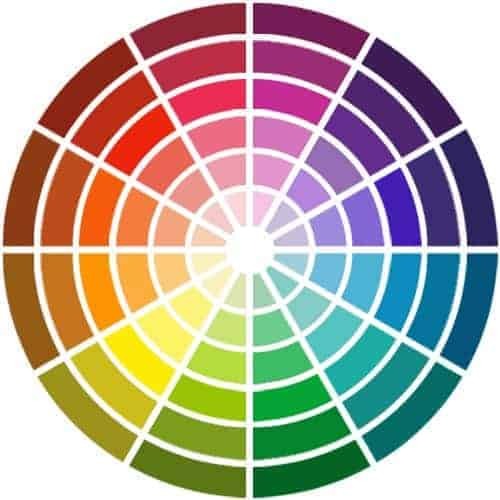 You know the color of your eyes, now look on the color wheel below the color that is opposite to the color of your eyes. The complementarity of colors will bring out your eyes … We will now a little nuance to help you really sublimate. You have seen that the orange color is the opposite of the blue on the wheel, so you understand that this color matches perfectly the color of your eyes and that it is she who will highlight the blue of your eyes. This complementary color will perfectly enhance your look so favor eyeshadow in orange tones such as brown, ocher and of course gold. You can also enhance your eye makeup by creating a gradient of many of these shades, which once mixed, will give shine and depth unparalleled in your eyes. Also think of some cold colors such as pink and purple ideal to illuminate your eyes differently. According to the complementarity of the colors, the ones to avoid are the blue and the green, seen that one arrives in tone on tone, those are those which logically will make the least stand out your eyes. But for example, an intense dark blue make-up can quite highlight very clear blue eyes. not to mention mascara to make your eyes stand out even more. As you can see from our diagram, red and pink are your allies. And depending on the complementarity of colors, the ones to avoid are green and blue, but good nothing prevents to have fun from time to time playing with the colors that make us want just! apply black pencil in the internal lining and / or a line of black eyeliner. add mascara, here you are! If you are the proud owner of pretty brown eyes, you have probably already said that you would have preferred green or blue eyes. But did you know that with your brown eyes, you can wear all the colors! Of course you can interrogatively look at the color wheel seen above. But the brown is a dark color, the purpose of the complementarity of colors should be seen a little differently, because in fact it is all the light colors that will highlight your look and in the other direction all the dark colors will give the intensity! That’s it you understood, in makeup for the eyes: everything suits you. So you have carte blanche! Indulge yourself with a colored eyeliner, why not a shiny eyeshadow and a layer of mascara, you’re ready! Tip for all eye colors to brighten your eyes: put a touch of white makeup in the inner corner of the eye to enlarge your eyes! See you soon for some news, dear Fuzzy!